A sponsored abseil event took place on Saturday 5th and Sunday 6th October 2013. Adventurous participants, including one of our Consultants, Simon Aldridge got the rare opportunity to abseil from the 212ft tower, the second highest in the country. 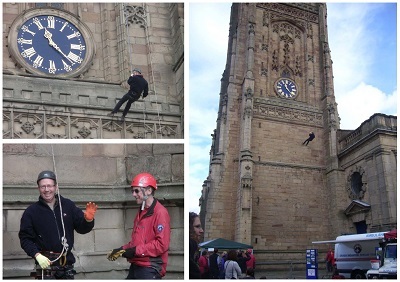 All money raised will be split between Derby Cathedral and Derby Mountain Rescue. Those completing the abseil climbed the 189 steps of the historic tower before enjoying some of the finest views of Derby City centre. They then made an exciting descent to the ground by abseiling down the outside of the tower, all under the watchful eye of mountain rescue experts. Roger Guest, Director, said “ We are very proud of Simon and his achievement to raise money for this good cause”.